I'm always supportive of our military veterans and I make cards for those who are involved in the Honor Flight trips to our nation's capital. I also try to honor them on Memorial Day and that's coming up the end of this month. This is a sample of the style I like to do and I've done half a dozen of these over the last two years, using this same image and color combo. The image is from Delicious Doodles and the poppies are perfect for veterans. I printed the image twice, coloring one and leaving the other black and white. I die cut the colored one with a plain circle die from Spellbinders, inked the edges with black ink, and layered it onto the black and white image. This "spotlight" technique is one of my favorites. To make the red pop even more, I used black CS for the card blank, adding a panel of white inside for writing the note. I printed the sentiment, hand cut it, inked the edges, and added it to the image piece. Offsetting the image on the card front left me room to add the single, red, bow with the pearls. Since I don't know if this card will go to a man or a woman, I did only that minimal embellishment, keeping it pretty CAS. Perfect!!! I like the spotlight technique you used on here too. This will be a wonderful card for a veteran. Just love this Connie, something I haven't done in a while is the spotlight technique and must have another go of this. Gosh I haven't done this technique in ages ... thanks for inspiration Connie! Thanks so much for playing in our ‘Flowers’ challenge at Dies R Us and the ‘May Flower’ challenge over at Double D. Good Luck and please come back again soon! Love your "spotlight" such a lovely card and thoughtful too. Love the spotlight technique. Thanks for joining us at Dies R Us Challenge Blog. We hope you will join us for future challenges. This is gorgeous and a lovely technique for a CAS card! Brilliant technique, love the pop of red on your card. This is so beautiful. Love the black with touch of red. Nice work. Thank you for sharing with us over here at "A Perfect Time To Craft" and best of luck with your entry. I love how you made the focus of the card the flowers. Beautiful work. So glad you joined us at Die Cut Divas. Oh I love poppies! Your card is beautiful! 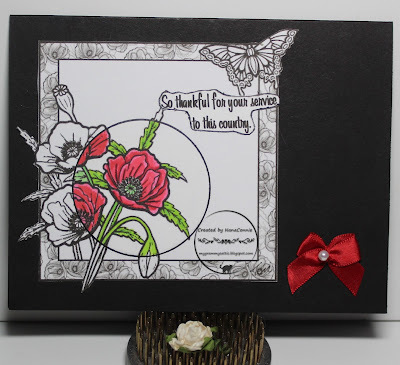 Wonderful Beautiful card thank you for joining us at I love Pro Markers good luck and big hugs Sharon DT.